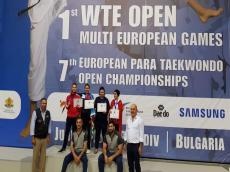 Azerbaijan's national team took part in the 7th European Para Taekwondo Championship held in Bulgaria on May 31-June 10. National team grabbed two medals at the championship, Trend Life reported. Aynur Mammadova won a gold medal. Aynur Mammadova is the head of the public association "Integration into the sport of children and youth with disabilities." She is a three-time World Champion and two-time European Champion in para Taekwondo. Besides, Mammadova also took part in national projects as a model. Nijat Muslimov became a bronze medalist, while Imameddin Khalilov, Abulfaz Abuzarli and Vugar Abishirinov could not reach the semifinal. The coaches of the national team are Yashar Seyidov and Farid Tagizade. Notably, the national team visited Bulgaria with the assistance of the sports and health club of the Ministry of Emergency Situations and Azerbaijan Ministry of Youth and Sports. Over 170 Paralympic athletes from more than 20 countries took part in the competition, Trend Life reported. The competitions were held in four classes: K41, K42, K43 and K44, besides participants were divided into 3 weight categories up to 61 kg, up to 75 kg and over 75 kg - among men, up to 49 kg, up to 58 kg and over 58 kg - among women. Azerbaijani Paralympic athletes achieve more and more success year by year. In 2013, Azerbaijani two-time Paralympic champion and four-time European champion won gold medal at the IBSA Judo European Championships. Only in 2015, the Paralympic athletes have won 79 medals – 32 gold, 28 silver and 19 bronze. The National Paralympic Committee of Azerbaijan (NPKA) was established in 1996. The Committee is developing 12 of the 19 Paralympic sports. By the 2020 Paralympics in Tokyo, two sports will also be added to them.